NAS Systems are getting popular for both home users and companies. They are compact and have much better management solutions which can act as both storage device and great multi-media functionality. Today, we will review QNAP TVS-x63 series Network Attached Storage Server, specifically the TVS-463 model. 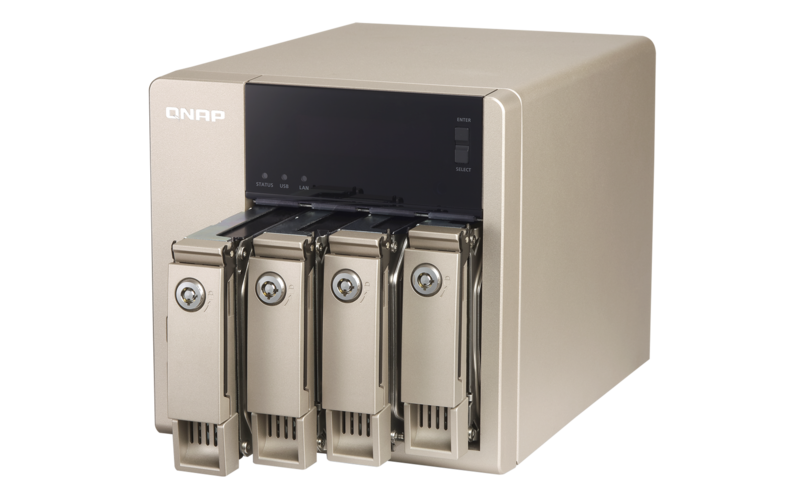 QNAP is famous for creating worldwide NAS solution and have already released popular NAS solution in the market. The most important feature anyone looks in an NAS solution is the usability of a NAS solution working in conjunction with hardware, software, and configuration. TVS-463 makes sure it provides extensible user experience with QTS technology. QTS, the advanced Turbo NAS operating system, is secure, simple, reliable and scalable. The user-interface provided by the QTS is simple and intuitive in nature. The efficient menu system is pure navigational based with a clear focus on great user interface. The user can easily create shortcuts,multi-task and more. On the other hand, the Qfinder utility makes installation very easy. There are a few ways to install the system and Qfinder Utility automatically install all the necessary tools and upgrades directly into your NAS system. The Qfinder Utility works without the need for the internet. The utility will boot up the system and get it ready to work in the local environment. The TVS-463 delivers as much as 425MB/s read and write speeds with 4 x GbE port configuration, and to as much as 1,481MB/s along with 10GbE configuration. The TVS-463's hardware run encryption engine along with AES-NI delivers unparalleled encryption performance within its class. It handles as much as 691MB/s along with AES 256- bit, full NAS volume encryption, boosting security and system performance and at the same time ensures the safety of any confidential business data that is kept in the TVS-463. Sharing is the fundamental functionality of TVS-463 system. To facilitate files transfer between different networks and operating system, the NAS system supports many protocols including NFS, SMB/CIFS, and AFP protocols. The cross-platform file sharing feature enables users to seamlessly transfer files and not bobbed down with complexity and difficult configuration. Users can also configure other user's permission and facilitate correct parameters for securing the files on the NAS system. Data is volatile if not backed up properly. The NAS System, TVS-463 comes with all the necessary tools to backup your data properly. 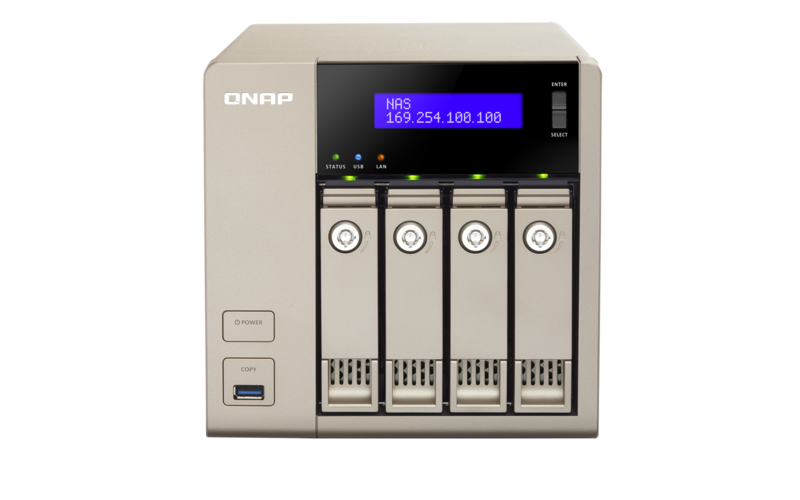 With the QNAP NetBack Replicator, your data can be backed up both real-time and scheduled timings. Email backups can also be created and the solution works seamlessly with the MAC OS and other operating systems. To make copying data easier, the NAS system sports a one-touch copy function USB 3.0 port. This can make copying files super fast and you can easily back up your data to external devices. Also, the TVS-463 supports third party software such as Symantec Backup Exec or True Image for excellent backup routine. NAS was specially built for storing valuable file resources and as a file system. But, with the advent of more complex technologies, users can use the multimedia functionalities wrapped within the box. TVS-463 comes with all the amenities including the exclusive QvPC technology that transforms the little gold box into a PC for an exhilarating multimedia experience. All this is done through the VM integration, HDMI output, NAS connection technologies, cloud integration and others. The end result is simple and quite amazing! A powerful PC that can playback all your amazing video and audio collection. Due to enabled virtualization, you can choose to load Linux, windows, android based VM's on top of the QvPC technology. Moreover, the support for 7.1 channel audio and HD quality video rendering, it is the premier multimedia setup you can have. All you need is a keyboard, mouse, monitor or TV and an HDMI cable to plug in the display with the device. Nowadays it is tough to find a decent hardware that can make you jump from your seats. Well, the TVS-463 does just that! It enables the user to be the center of all the attraction, providing them with spectacular features. One of the most impressive feature is the audiovisual experience. The TVS-463 supports all the necessary tools to bring you perfect home theater experience such as easily connect a dual monitor using the dual HDMI ports. The HD station also came with one more feature that truly explains the breadth of functionalities the device is capable of providing. With a keyboard and mouse, users will be able to run multiple applications via the virtual machines, surf the web using Google Chrome or Firefox, watch full HD videos and more. With so many multimedia features packed, another feature that will make the TVS-463 a beast is the real-time video transcoding. With the real-time transcoding, all the video files in your NAS system will be converted to a universal format that can be played on different devices without any problem. The real-time transcoding also saves time and enjoying videos was never the same. Furthermore, TVS-4632 also supports offline video transcoding. No system is limited nowadays and that's why most of the unique features can be improved on by adding on-demand apps to the existing system. The great pool of apps improves the functionality of the device. Furthermore, it also supports third-party developers. 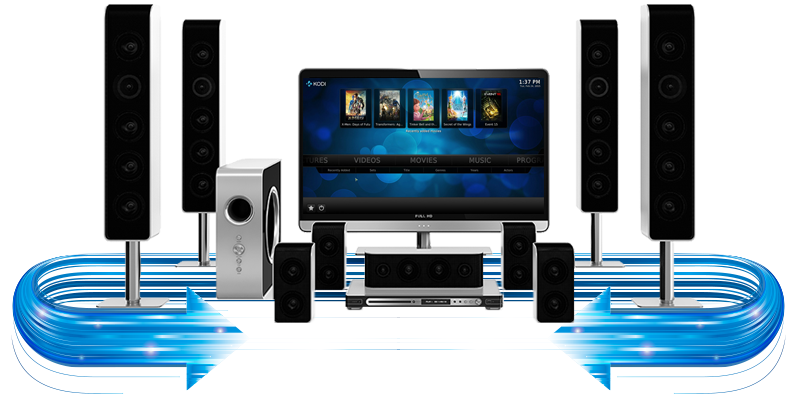 Apps which improves the backup/sync features, communications, download, entertainment and others can easily be downloaded and work seamlessly with the TVS-463 system. In short, there is no limit on how versatile TVS-463 could become. TVS-463 comes with disaster recovery solutions such that you can recover data in case of any disaster. RTRR supports make it possible for disaster management recovery. To make sure that the system is secure and to protect vital information from different hackers, TVS-463 offers 256 encryption and access control for different users. The administrator can easily set a different level of security and can protect the system from unauthorized access. Complete support for virtualization, enabling different applications to run within the environment. Supports Surveillance solutions. It comes with a support of over 2,700 compatible IP camera models and can be used on mobile applications as well. TVS-463 storage is extensible and can be used to improve dynamically with time. Great build and display for premium looks. The display also makes system management easier. TVS-463 is truly one of the best NAS solutions by QNAP. It supports proper system backup, virtualization, complete multimedia support. With the QNAP TVS-x63 series NAS (Network Attached Storage) server, you'll enjoy the best audiovisual experience with HD Station and dual HDMI. It also has a simple and efficient menu system and easy setup thanks to its Qfinder utility and it also provides an easy process for backing up all your important files, well rounded solutions that will secure all your data. One of the hottest features of the QNAP TVS-463 is that you can use it as a PC thanks to its exclusive QvPC Technology and impressive 4K display support basically, it’s as simple as plugging and playing - just plug your keyboard, mouse, HDMI cable to either a monitor or TV and you're good to go.